Would you like to know how to solve the most common problems facing pet owners? Nadia Crighton takes a look at the first segment in our HELP! series to uncover how to stop a puppy from biting. 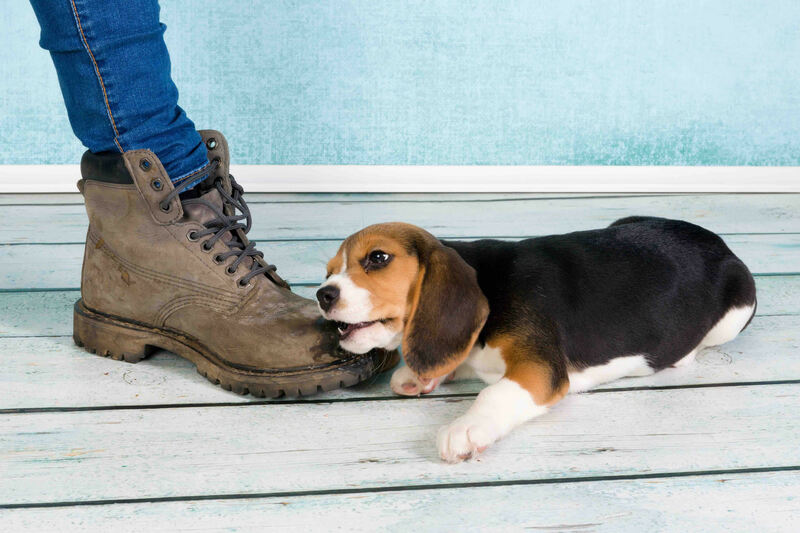 It is not uncommon to hear of frustrated puppy owners, who are annoyed by their pups’ constant need to bite. This puppy biting is better known as ‘mouthing’. It’s due to your pup’s desire to explore and the best way they do this, is with their mouths. Just like a young toddler, who loves to put EVERYTHING in their mouth; your young dog is also testing out the world with their teeth, tongue and jaw. When puppies play they constantly mouth and bite each other. When the one pup goes too far and the biting turns into a painful nip, the pup will yelp in distress causing an immediate reaction – the pup lets go. This type of play is teaching the puppy – what is appropriate and what is not appropriate – when it comes to playing and biting. Hence the reason why puppy-preschool classes are so important, as your pup will learn this only from other pups. This type of play is very important, as it will teach your adult dog to have a nice soft mouth. The only way they will learn this is from trial and error. Pups should have completely stopped biting by six months of age. If your older dog is still biting and nipping, seek professional advice from a dog trainer. Your expectation of your puppy and their behaviour can begin the day you bring them home. Never encourage your puppy to chew your hands, and give your puppy a sharp indication that chewing or biting you is not acceptable. Your pup may mouth you occasionally, but once this turns into a bite you must react as another puppy would (yes… yelp!). A high pitched “OUCH” when your pup bites you. You can use your “AH AH” command. This is a great command you can use for any unwanted behaviour. It is firm, consistent and sends a clear message that this biting behaviour is not warranted. Grab a toy: a teddy or rope, and allow your pup to take out their excitement on the toy, not your hand or clothes. Just remember to avoid tug-of-war with a young dog as it can damage their jaw and neck. Rather allow them to shake the toys themselves. More tips on house training your puppy here. For a pup, a shrieking child, flapping their arms around yelling “go away”, signals “PLAYTIME!” So it’s very important that you teach your children how to behave around the puppy. If the puppy is getting too excited, jumping up and nipping them, it’s important that they use the “AH AH” command or “STOP” command in a firm voice while standing still. Get them to behave like statues with their hands in a fist under their chin – nothing for your pup to grab onto. Running will only encourage your puppy to continue their behaviour. Always supervise your puppy and your children, during play sessions. Get your children to interact with your pup with a toy, so the excitement is taken out on their ‘teddy’ or ‘rope’ and not your child’s hands. Also, if your puppy is overly excited and not calming down, pop them into their ‘safe area’ for a few minutes to calm down. Allowing puppies to jump and bite young children is not advisable. Remember that the behaviour you allow now will continue when your pup is fully grown. If your puppy is particularly interested in your children’s hands, use a eucalyptus chest rub on their hands before they interact with the pup; this will stop your puppy from biting.